When it comes to applications involving extreme temperatures it is important to give special consideration to the type of conveyor belt being used. High temperatures can cause serious damage to a conveyor belt making selecting the correct thickness of the cover a necessity. At Sparks Belting, we have 3 specially designed high temperature belts to withstand extreme high or low heat. The SR 25 is a thin yet strong belt that is ideal for heat sealing machines, shrink tunnels, automatic weighing and feed conveyors, and food applications. It is made with fiberglass which gives it a very high heat resistance being able to withstand temperatures of -70° to 450° F. The silicone in the belt creates excellent release properties. The SR 25 high temperature belt should be used on a small diameter pulley. The Multi-Temp belt is made from a butyl rubber compound which give this belt it’s high temperature resistance. However, this belt is usually recommended for extreme low temperature applications where cold rooms or freezers are involved. The Multi-Temp conveyor belt can withstand temperatures ranging from -60°-300° F and is considered to be a step up from the SR 25 as it can be utilized on larger diameter pulleys. 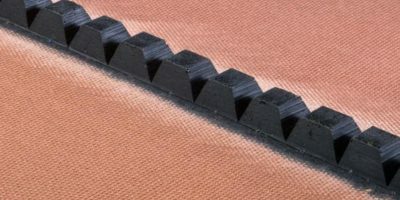 The Tev Tex conveyor belt comes in a 2 ply as well as a 3 ply version and can withstand temperatures of 0°-250° F. These belts are made out of a Buna-N rubber compound with a Teflon surface cover. 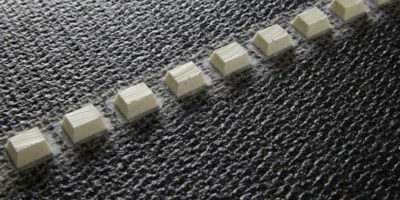 The Teflon cover on the Tev Tex belts allows for superior release and easy cleaning of sticky products such as candy, glue, chemicals, and hot plastics. Do not use conveyors with scrapers or where pulleys cause the belt to severely back-bend as this can damage the Teflon. These 3 specialty belts are designed for extreme temperature applications. To assist with positive tracking, a guide strip(s) is often used on the pulley side of conveyor belts. V–guides are the most common shapes used. However, square and rectangular shapes are also available. In addition, Sparks has designed and developed round dot-guides for traveling over very small pulleys. Guide strips will not guarantee tracking success on a conveyor or conveyor belt that is poorly manufactured or lacking dimensional accuracy. The conveyor system and conveyor belt should be manufactured to reasonably track by normal means so that the use of guide strips can further ensure trackability. The conveyor pulleys, bed and/or idler rollers should have an opening that is 1/4” wider and 1/16” deeper than the guide strip on the conveyor belt. Or conversely, the guide strip furnished on the conveyor belt should be 1/4” narrower and 1/16” shallower than the opening in the pulley, bed and/or idler rollers of the conveyor system. Guide strips are intended to improve tracking. They are not designed to drive the belt! In general, a larger pulley is required when guide strips are used in conjunction with the belt. 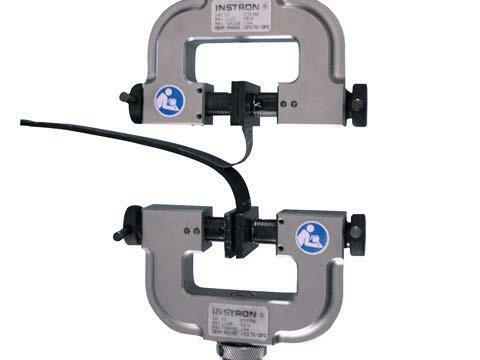 Smaller sized guide strips will operate over smaller pulleys better than larger guide strips. 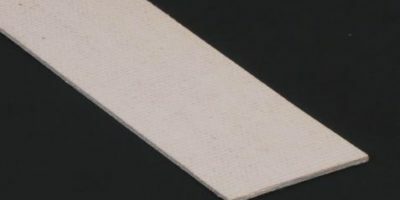 Guide strips made of softer durometer materials (i.e. 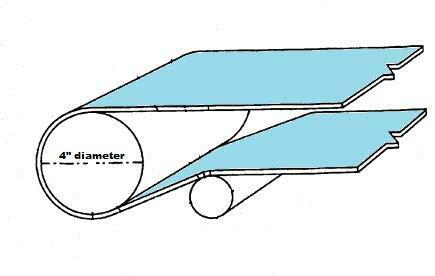 PVC) will operate over smaller pulleys better than harder durometer materials (i.e. Polyurethane). Notched or segmented guide strips will navigate smaller pulleys better than solid guide strips. Guide strips can be supplied down the center of the bottom of the conveyor belt or off-center to reduce wandering (side to side movement). While it seems logical that two guides are better than one, it isn’t always true! Two guide strips require more precision in the conveyor design and in the placement of the guides on the belt. However, when two guide strips are required, the critical dimension is the center to center distance of the guide strips from each other. This is far more accurate (due to width tolerances in belting) than measuring from each edge of the belt to the center of each guide strip! Conveyor belts are the driving force in conveying operations. There are many different types and materials for the abundance of applications in the market. 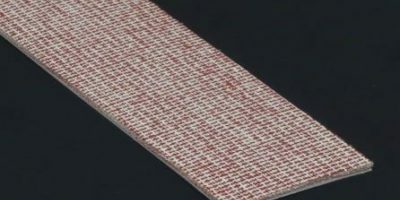 However, there are a few different textiles that serve an important purpose in conveyor belting. Solid woven cotton is often used in baking applications where belts must “breathe”, absorb, and/or handle warm products. It is also used in applications to handle warm, green rubber products. Cotton is used in length, width, or in both directions of multiple plied conveyor belting to increase the bulk of the overall product on applications which require resistance to impact without requiring high strength. Most commonly, it is placed either on the top or bottom ply of multiple plied belts to provide lower drag against the conveyor bed or some conveyed products – like cartons. A nylon core is used to provide high strength as required in some flour, paper, box, and wood applications for conveying products or transmission of power. It is used as the width fiber (fill yarn) in conveyor belting to increase rip resistance and fastener retention as well as to resist abrasion from building material products. Solid woven polyester is used as a durable and low cost option for general conveyance, with specific uses in parcel, package, and baggage applications. Polyester is used in the length (warp), width (fill), or in both directions of the weave as an inexpensive carcass for multiple plied conveyor belting. Spun polyester generates less noise and is used when higher speeds are used on long(er) slider bed applications. 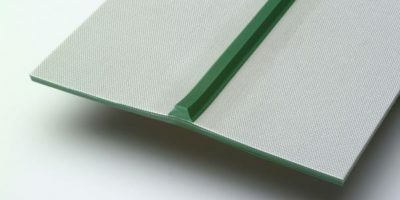 Kevlar is used in glass applications where belts must withstand hot temperatures and retard flames, in heavy applications near industrial furnaces or conveying hot products being discharged from heat processes, and in heavy applications where resistance to high or heavy impact is important. Whether handling dough, cooling baked products, cutting, molding or packaging, Sparks has a complete range of products for the bakery, biscuit and snack processing industry. Our technical experts have the experience to assist you in selecting the proper belt for your application and ensure the belting we deliver has the performance you need; and accommodates ingredient and heat compatibility, flex, load-carrying capacity and release characteristics. There are key factors in the selection of the proper belt for the application. When transferring the product between operations — whether it’s a tight transfer of a finished product, roll forming, or a dough dump — the belts ability to flex over a knife edge transfer or over a rolling nose bar are important factors to consider when selecting the right bakery belt. Gripping and releasing the product at the proper time impacts the output volume/feed rate and selecting the proper fabric and compound for each operation allows the product to be released correctly. At Sparks, our application specialists are well trained and can recommend the right belt with the right flexibility that will work best on your conveyor design. When producing specialty breads, the conveyor belt needs to be compatible with both the environment and the ingredients. Dough consistency, moisture, heat — these are factors that all need to be considered when selecting the proper belt. At Sparks, we stock conveyor belts with various fabric construction designed to endure the environment and produce quality breads. With a wide variety of bakery belts to choose from — whether a specialty bake shop or a large, high-volume bakery — we specialize in the ability to handle every application. Need help selecting the right conveyor belt? Our goal is to provide your operation with maximum output, reducing excess scrap, and downtime. We have the experience to assist you in selecting the proper belt for your application. We want to ensure the belting we deliver has the performance you need; and accommodates flexibility, ingredient and heat compatibility, load-carrying capacity, and release characteristics.